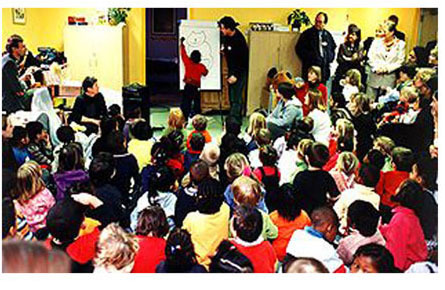 I have visited over a 1000 schools and libraries with my early learning interactive storyplays. Last year I was at the Bradford Literary Festival, the East Riding Festival of Words and visited schools for Leeds, Hull and Nottinghamshire libraries. Visits for 2019 begin in Leeds on March 4th for the Leeds School Library Service. The action: First, I draw Goz and his friends. The children join in by trying to guess what animal it is going to be. They suggest names and new characters. Some children are invited to come up and add details to the drawings, such as whiskers and claws, but the line intended to be a dog, may end up as a baby standing on its head! We read the 1st Goz story, then the children act it out using the costumes and the karaoke machine. They become a living book. The stories can change and extra characters can be added depending on the size and length of the session. The idea is to give a spark to the children’s imagination and creativity, so that afterwards they can make up their own stories and drawings in class. 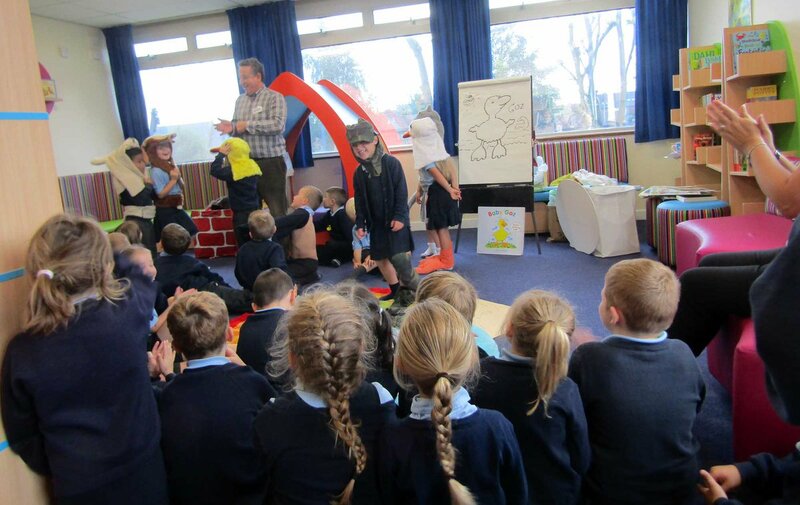 The 3 Little Puzzle Pigs: 5 children act out this version of the well known story with a lot of audience participation and the new Story Play Fold Away houses. Can get quite lively! Talking about making books and writing stories using the flip-chart and storyboards to show how to get ideas, invent and develop characters etc. Working with the History craft series: Egyptians, Greeks, Romans, Vikings, Middle Ages, Prehistoric. The core activity lasts a minimum of 40 minutes and is adapted to suit the ages and abilities of the children. For example: more reading and drawing by myself and the children, questions and answers about making books. Enough room for the children to act out the play. In the hall or library if possible, with the children coming to me. I bring everything needed with me. Flip-chart,many large sheets of paper. A large box shaped like an egg. Animal costumes (heads and tails) for several plays based on the books. Book signing at the end of the day if required. 40 pence a mile (Costumes and props to transport) and overnight accommodation if necessary. Thanks for giving us a great link with our local primary school - something we have been trying to do for years - and you just magicked them in to loving our library. The best author visit we've had. I brought my Year 2 class to see you at Fairfield Library. What a good morning it was. The children had a great time (so did the members of staff). When we got back to school, the children were buzzing talking about the visit. They really enjoyed the drama and found it great fun, especially the dressing up.